Hairdressing Courses and Hairdressing Apprenticeships in the South West. Hair Academy South West is at the cutting edge of hairdressing training and education. From Work Based Learning Apprenticeships, City & Guilds NVQ qualifications, barbering, diplomas, creative colouring and short or long term courses. 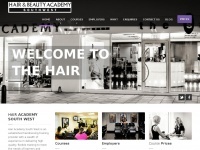 Hair Academy Southwest is specified as the websites creator.